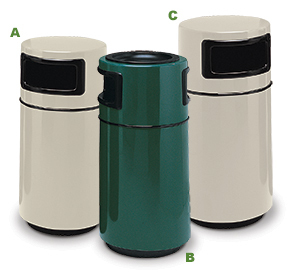 Tough, hard-working and sleek, these round 25 gallon side entry fiberglass receptacles are built to last. The fiberglass material will not corrode, rust, stain, tarnish, burn or deteriorate because of chemicals or weather elements. They are also highly sanitary and secure, featuring no exposed seams, welds or crevices to harbor dirt. Offering a flat lift-off lid and a large side entry disposal opening with protective edge strips, completing the clean look. Servicing and maintaining the receptacle is hassle free with its sturdy, ridged black ABS liner. A supportive recessed base protects the receptacle from damages and provides simple floor cleaning around the unit. These receptacles are skillfully constructed for indoor and outdoor use and work especially well in cafeterias, entrances and seaside. Single or Dual Entry and Ash-Trash Side Entry lid options available.